The Juggling Homemaker: Tip of the day: Husking made easier! We've gotten a great crop of sweet corn this year, and I've been husking it with the kids like crazy in the last few weeks--either for dinner, or to preserve it in the freezer. The one thing that makes me crazy about corn is all that hair! It's a pain to get off the ears and then it gets everywhere else when you're done. You'd think it shouldn't be that hard to clean up, but it's just sticky enough to prove you wrong. Norwex has come through again and made my life easier. 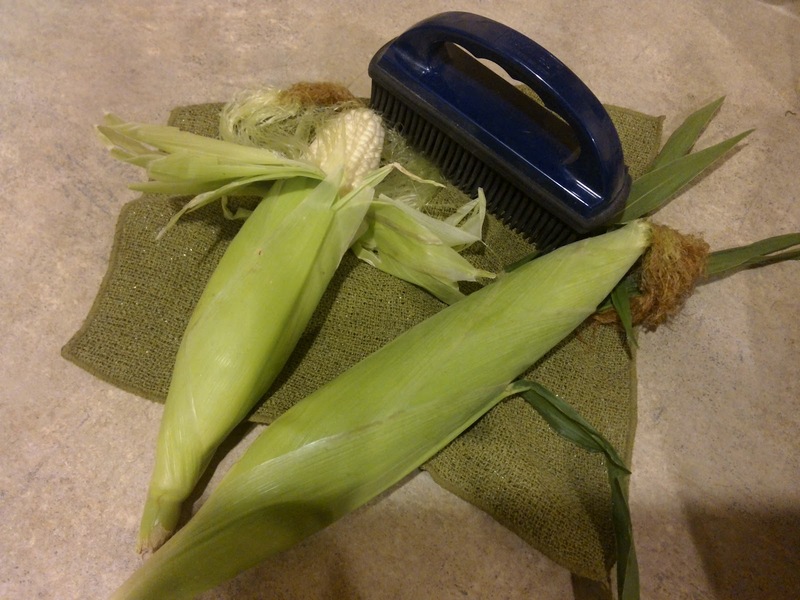 I learned that the polishing side of the Veggie and Fruit Scrub Cloth is excellent for getting off those little hairs on the corn. Then, by chance I figured out that the Rubber Brush sweeps it all into a neat pile for easy clean-up. I decided to try the rubber brush trick after finding out how effective it was at removing the pet hair from the floor of our minivan. So while I wouldn't go so far as to say that husking corn is now the highlight of my day, I would say it's not the chore it was before.